A demure-looking bowl, I know, but this posole is punchy. Posole is brothy stew of homily and usually pork too. You can make a vegetarian version that does a good job at achieving a deep flavour just the same by using a healthy amount of spices and toasting them. The dark beer I use certainly helps. That was a trick I picked up from a friend who adds dark ale to her chili. Sometimes when I taste this dish to check for salt, the spice is so strong it catches at the back of my throat and I think maybe I’ve gone too far. Yet I find that somehow though the flavours deepen, the heat mellows after a while–odd, right?–and the next day I almost want to add a splash of hot sauce. Still, note all of this with caution and use less chili powder and/or omit the chipotle chili if you’d like a milder version. No canned brand that I’ve found beats the flavour of good dried beans soaked overnight and stewed simply. 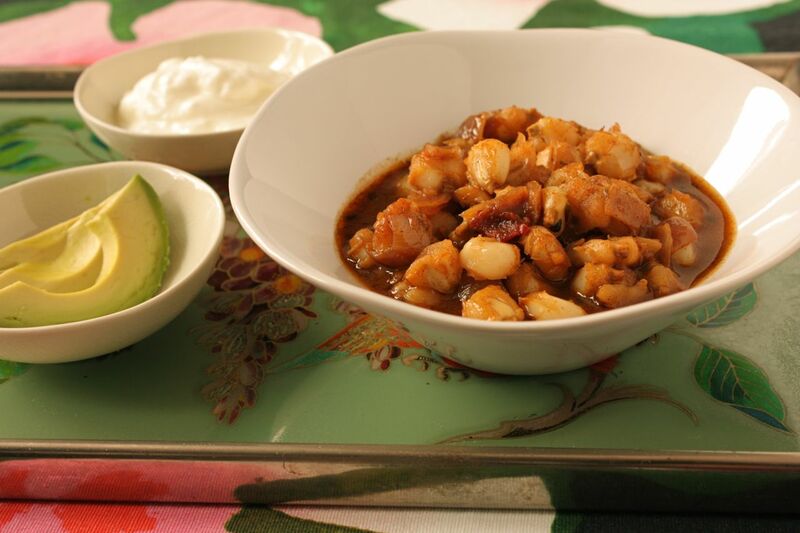 But I have a hard time finding dried hominy so I’ve only made posole with canned hominy. I imagine using dried hominy would make this posole much, much better. Though having a one-pot dinner on the table in a half hour flat tips the scales a touch.